Stampin' Up! UK Demonstrator Abi Bundy: New demonstrator starter kit offer! may 1st ! New demonstrator starter kit offer! may 1st ! We’re excited to announce that beginning 1 May, we’re offering a fully customisable Starter Kit for new recruits at a new lower price of £99! This will give you the perfect start to your businesses--your way! It will help you more easily share the Stampin’ Up! opportunity with your friends family and potential customers. When a new demonstrator joins Stampin' Up!, the choice is hers to put together a kit with any of our current high-quality products--she can choose up to £130 worth of any Stampin’ Up! products! 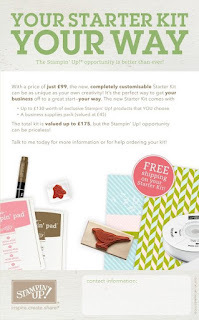 She'll also receive a business supplies pack (valued at £45) to create a kit with a total value of £175 that still ships for FREE! With the introduction of the new Starter Kit, new demonstrators will no longer have the option to purchase another kit or the add-ons. If you have recruits who want to order the current kit option, they will need to place their order by 30 April 2012, 3:00 PM (GMT). So I will soon be introducing a new mailing list system so keep checking back for it to be ready so you can receive monthly updates and news from me!